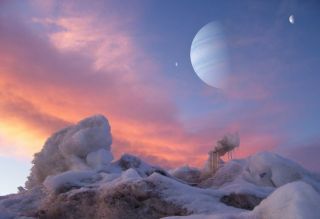 This artist rendering shows the view from a hypothetical habitable exomoon in orbit around Jupiter- and Saturn-like worlds. NASA's planet-hunting Kepler telescope, which astronomershope will find Earth-like planets orbiting other stars, might also findhabitable moons in other solar systems, new research suggests. Kepler?s primarymission is to monitor thousands of stars looking for characteristic dips intheir brightness as orbiting planets pass in front of them in so-called "transit"events. The orbiting observatory, launchedin March, already detected the giant extrasolarplanet HAT-P-7b within its first 10 days of taking data. The planet hadpreviously been discovered by ground-based telescopes, but the observationsshowed Kepler works as expected. While ground-based observatories, and even some spacetelescopes, such as Spitzer and Hubble, can find Jupiter-sized extrasolarplanets, Kepler is the first telescope aimed at detecting alien worlds closerto the size of our own home planet. One astronomer suggests that Kepler's capabilities may evenbe able to detect so-called "exo-moons." David Kipping of University College London has alreadydevised a method for detecting exomoons but no-one was sure whether it couldreally be used with current technology. He and his team have now modeled theproperties of the instruments on Kepler, simulating the expected signalstrength that a habitable moon would generate. An exomoon?s gravity tugs on the planet it orbits, makingthe planet wobble during its orbit around its host star. The resulting changesin the position and velocity of the planet should be detectable by Keplerthrough accurate timing of the transits. The scientists considered a wide range of possible planetarysystems and found that a fluffy Saturn-like planet, which would be low in massfor its size, gives the best possible chance for detecting a moon, rather thana denser Jupiter-likeworld. This is because planets like Saturn are large ? blocking out a lotof light as they pass in front of their star ? but very light, meaning theywill wobble much more than a heavy planet. If the Saturn-like planet is at the right distance from itsstar, then the temperature will allow liquid water to be stable on anysufficiently large moons in orbit around it. Such water-bearing moons might behabitable for life. "For the first time, we have demonstrated thatpotentially habitable moons up to hundreds of light years away may be detectedwith current instrumentation," Kipping said. The team found that habitable exomoons down to 0.2 times themass of the Earth are readily detectable with Kepler. "As we ran the simulations, even we were surprised thatmoons as small as one-fifth of the Earth's mass could be spotted," Kippingsaid. While it is not known if habitable exomoons are common inthe galaxy, the observatory could potentially look for Earth-mass habitablemoons around 25,000 stars up to 500 light-years away from the sun. In the wholesky, there should be millions of stars which could be surveyed for habitableexomoons with presenttechnology. "It seems probable that many thousands, possiblymillions, of habitable exomoons exist in the Galaxy and now we can start tolook for them," Kipping said. The team's findings will be detailed later this month in thejournal Monthly Notices of the Royal Astronomical Society.